A Pair of Hoof Boot Comfort Pads from Easycare. The Easycare Easyboot / Old Mac / Trail Comfort Pads can be used in the whole Easycare Range of Hoof Boots and also ALL Makes of Hoof Boots. You Just simply put the boot on top, draw around and cut out with a sharp pair of kitchen scissors and insert inside any boot like an insole. Old Mac / New Mac / Easyboot Trail comfort pads are the ideal compliment to almost any hoof boot in the Easycare range. The comfort pad is a flat pad designed to increase comfort and reduce concussion. Comfort pads increase heel comfort so that all horses- sound or unsound- are encouraged to move correctly. Comfort pads can also be a useful tool to improve the fit of a boot. A comfort pad will provide cushioning, additional protection and and shock absorption to the hoof as well as support to the frog. Comfort pads are an excellent aid in transitioning a horse from shod to barefoot, and exercise both the internal and external structures of the hoof to help build a stronger hoof capsule. 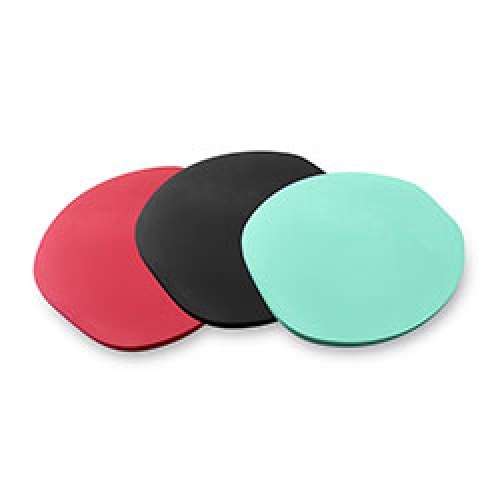 Comfort pads are available in three densities; Soft, Medium and Firm. Soft = (GREEN) are ideal for very sore horses, or as the top pad in a stack if required. Medium = (BLACK) are the most popular density as it offers resistance coupled with a good amount of give. Sizing : One Size Fits All - Just Simply Cut To Size! 6mm which is ideal for everyday use, or to stack in any density combination to alter the fit of a boot if the heels are very short or the hoof sits too low in the boot. 12mm are a brilliant pad to help encourage a hoof to strengthen and improve, a soft or medium 12mm is usually the best pad to use on a transitioning horse, the more sore the horse is the softer the pad should be.